Happy Thanksgiving from Fargo ND! It hasn't been above 25 degrees yet, which plays nicely into Kirsten's plan to keep the boys in matching holiday sweaters until New Years Day. Unfortunately it also plays into the Gap and Old Navy's plans as well. So it goes. Porter is still roaring at people, a hold over from Halloween when he was dressed as a lion. Jack is doing well. He doesn't have any antics to report....well he did eat his home made 'hand turkey on a depressor'. Rosie and Millie are having fun with Charlie and Jaxon. Pat will be extra busy picking up the back yard this week. Unless he delegates the work to Lindsay....good luck. If we don't freeze solid we'll blog again soon. Happy Thanksgiving everyone. Tom's been sick with a terrible cold, so most of his time has been spent in bed and whining about his chest hurting and his nasal passages being clogged. Although, he did feel well enough to make fun of me for putting the Spoon website connection on our Blog, so now I suppose I'll be taking that down! Tom has been contemplating buying a new bike since he started commuting on a 25 year old Panasonic. We have spent countless hours on the internet looking at different bikes and going to every shop in town over the last month. And he says I'm indecisive! He still can't decide which bike to get! Maybe I'll start a poll. In October we went to NYC without the kids. Margie and Terry were kind enough to come and stay with the boys. Here's a picture of us in NYC. We went to the Stenehjem family restaurant while we were there. It's called Stonehome and it was FANTASTIC. We had a great time hanging out with Sara and doing what she gets to do all the time. I have to say though, I don't think I could live there. So many people, and so much shopping!! 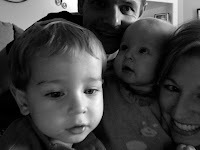 Hello from our first family blog. I thought that since everyone else was doing it, we should too. So, here's the first entry. Porter was a roaring Lion for Halloween and loved going to all of our neighbors asking for candy. Although, I think Tom and I have eaten most of it. Jack was the ever popular duck. But he sure made a good one. Right now he sounds more like the exorcist rather than a cooing baby - who knows what that is about. I tried to get Porter and Jack into the yard for some photos, but Porter cried and Jack wouldn't sit still, or really sit at all, at 7 months he's still not quite sitting up on his own. Looking forward to Thanksgiving in Fargo.